First, decide what quality level best suits your needs; then, narrow things down by size, shape, and color. Searching for the right standing desk mat for your standing desk can be daunting. They come in all sizes, colors, and quality of construction—from flimsy residential rug types to sturdy commercial-grade models designed for all-day use at a standing desk. Given the importance of your health and productivity, we recommend focusing your search on the latter end of the spectrum. Most consumers start their search for the best standing mat by price range, but the relationship between quality and price is not necessarily linear with standing mats. In fact, there are as many expensive mats of poor quality (e.g. 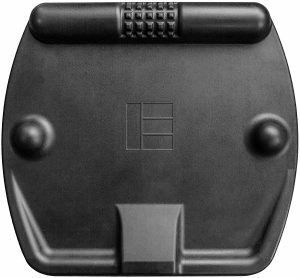 the Ergotron Workfit Floor Mat at $199) as there are exceptionally good mats at more affordable prices (e.g. the iMovR EcoLast Premium mat for as low as $109.95). Anti-fatigue floor mats made with low-cost materials might as well be disposable; they’ll either start coming apart or lose their buoyancy within a year. These were originally designed for kitchen/home use and won’t last long in an office environment. Most consist of an outer layer of rubber, vinyl, or polyurethane, with one or more layers of inexpensive foam and/or gel inside to keep material costs down. Some of the more expensive mats are even made with multiple layers of foam inside (like the Imprint Cumulus9), and while this method sounds state-of-the-art, it just increases the cost without enhancing buoyancy or durability. 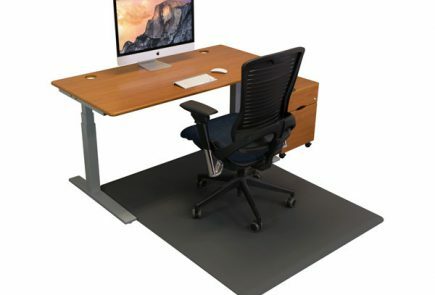 Commercial grade mats, on the other hand, are specifically designed for use at a standing desk, in dress shoes. Quality mats in this category will be much firmer and will maintain their buoyancy throughout the workday. They will also last many years longer and won’t be easily damaged by chairs or high heels. Through our research, we have found that the very best standing mats that will last the longest and never degrade in performance are made solidly of a material called polyurethane. For more details about how materials and construction affect mat quality, take a look at The Real Differences Between the Best Standing Mats and the Worst. Lo and behold, there’s a new wrinkle to the conventional anti-fatigue standing mat that goes beyond the usual expansion of colors, sizes, and designs. So-called calculated terrain mats (a.k.a. “non-flat standing mats” or “active standing mats”) are a subcategory of standing mats exploding onto the scene. Check out our new review category, Calculated Terrain Standing Mats to see how these mats stack up against one another. Below, you’ll find abstracts of each product review. Click on the product name to read the full review, or the button “Add to Comparison Table” (then ‘Go’ in the bottom right) to see their features side by side. Summary: With its 100% polyurethane unibody construction, this is the best-designed mat on the market today for serious standing desk use. 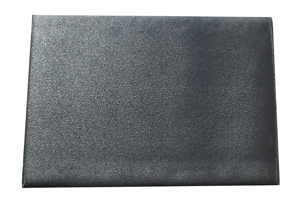 The Premium Standing Mat is durable enough to resist the wear and tear of dress shoes and office chairs, and it is 100% recyclable, made in the USA, and will never leech out odorous or harmful gases. Its industry-leading warranty is comprehensive, and this product should last you that long at least without any degradation in comfort or performance because it uses the best available material and is a robust 3/4″ thick. It is one of our two Experts’ Choice selections for the best standing mat you can find on the market. Summary: The Economy Standing Mat provides full standing support and comfort at a fraction of the cost of other high-end mats. It’s built from the same durable one-piece polyurethane construction but pared down in size and thickness compared to the more luxurious iMovR EcoLast Premium Standing Mat. Despite this, it still features the same anti-travel, anti-deterioration qualities that we’ve come to expect from EcoLast. Summary: The Imprint CumulusPRO Commercial Grade is made out of 100% solid polyurethane and similarly priced to the iMovR EcoLast Premium Standing Mat. But, due to the limited sizes (one), colors (two), and traction devices (none) that Imprint offers with this standing mat, this Asian-made pretender to the American-made EcoLast’s throne is not ready for prime time. Summary: The Kensington Anti-Fatigue Mat comes at a hefty price, so the natural question is whether it’s worth it? The patented material doesn’t improve on ergonomics of some of its competitors above. It’s got very modest style and offers only one size/color option. 5/8″ thickness doesn’t offer as much comfort as 3/4″. So, the short answer is: “No”. Read the long answer in our full lab review. Summary: The Imprint Cumulus9 is not worth much for serious standing desk use. This standing mat lacks buoyancy and durability and has a tendency to curl at the edges and form a tripping hazard. It is meant for short stints in the kitchen, as suggested by the color palette and pattern selection. Great warranty, but expect to take advantage of it every year or two. Summary: VariDesk first asked to have their standing desk mat included in our product reviews but then pulled out with no explanation, so caveat emptor—”let the buyer beware.” Marketing materials provided by the company seem to indicate this is a very low-quality product, and the measly 30-day guarantee cements this perception. We tried them out at a trade show and confirmed our suspicions that this is an extremely low quality standing mat. Summary: Sky Mat tries to conquer the home market of with a comfort anti-fatigue kitchen mat that can look equally great at your office, but poor quality, inconsistent service, and quick product wear makes it a poor choice regardless of where you’re planning to use it. After just months of use you’ll most likely see flaking of the outer shell and puncture wounds on the underside (if you have a habit of wearing heels). And we don’t even mention compression that comes with the soft type of foam material it’s made of, which makes standing less comfortable. Summary: While it barely moves underfoot even on smooth concrete floors (not a common but very much needed feature for anti-fatigue mats), Comfort Stand HD Mat doesn’t provide pain relief because it lacks support factor. This means that the mat sinks to the floor level under your weight, becoming as hard as the floor, which puts pressure on your legs and heels. A wide variety of sizes and 7/8″ thickness do give the mat an edge over the competition, but low-quality construction renders it all utterly useless. You can rip through nitrile sponge and cross link vinyl layer with your bare hands. What will become of them in an industrial environment? Summary: The Air Step defines “disposable standing mat.” This mat is too thin for serious use at a standing desk. If you do buy this product, pick it up in a 2-pack, because you’ll be filling the landfill with these at least once or twice a year. Our advice is to look to more upscale products. If you feel like traditional standing mats lack stability or portability there are mats with special features that take standing to the next level. Summary: The Dual Gripper features a unique anti-travel system designed to reduce the risk of unnecessary and dangerous slips. Yellow non-slip strips keep the mat in place on hard surfaces, while round grippers cling to just about any office carpet. Treadmill desk users with little floor space next to their treadmill can even set the 18″ x 30″ Dual Gripper on top of the belt for comfortable standing breaks during their workday. With the same durability, support, and warranty as the iMovR EcoLast Premium Standing Mat, the Dual Gripper is an elite standing relief solution. 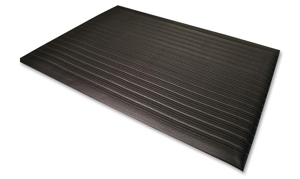 It is one of our two Experts’ Choice selections for the best standing mat you can find on the market. Summary: One mat, many uses. Perfect for sharing between multiple standing desk users, such as in a call center environment where its minimal footprint won’t become a tripping hazard. The Portable Standing Mat can also be thrown in the suitcase for business travel, taken to stadium games to make a comfy seat, or knelt on when gardening or doing household chores. 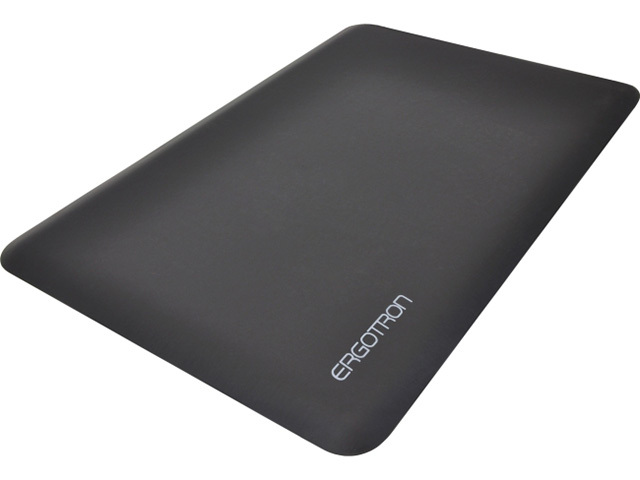 This mat offers the same comfort and durability as the iMovR EcoLast Premium Standing Mat with the convenience of versatility. 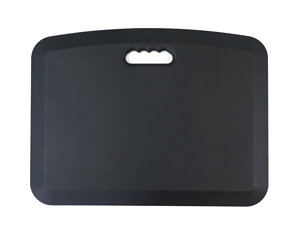 It is the best standing mat for your multipurpose comfort needs. Summary: iMovR replicated its famous EcoLast premium series quality in a budget EverMat Portable Standing Mat. The new series features almost the same formulation as the original American-made mats. This means that the EverMat is comparable in support and comfort to premium quality mats in the EcoLast line. 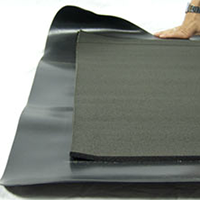 Available in a bigger size, EverMat is a versatile industry mat that can withstand harsh chemicals, heat (up to 400° F), and will not compress or delaminate due to its one-piece 100% polyurethane construction. Traditional flat mats are characterized by standard sizes and usually come in a variety of colors. Specialty mats offer more sizing options and non-standard dimensions, which enables you to use them in different work environments. Summary: Even treadmill deskers need to stand every now and then, and the TreadTop allows users to take standing breaks without dismounting. Its redesigned dimensions are optimized to fit on the walking deck of any office treadmill, and the 20″ x 32″ model was made especially for iMovR’s ThermoTread GT office treadmill. The TreadTop Standing Mat has the same damage-resistant, anti-microbial, and compression/delamination proof qualities of the iMovR EcoLast Premium Standing Mat with the advantage of creating a versatile treadmill desk workstation. Summary: Those that use a hard plastic chair mat know it is extremely uncomfortable to stand on for long periods, but bending down to move a standing mat in and out of place several times a day can be a pain. The good news is, there’s a great solution in the form of a supersized iMovR EcoLast Premium Standing Mat. Caster wheels will never damage the Hybrid or even leave an impression in it for more than a few seconds, and it is large enough for standing and sitting on with plenty of room to roll. Summary: The iMovR EverMat is a solid contender in the alternative chair mat category. Made to iMovR EcoLast’s exacting formulation, it provides all the anti-fatigue benefits for less. Its flat texture might allow for better caster movement while the firmer feel offers a bit less imbalance. If you prefer firmer mats to cushy ones, EverMat has a good support factor and firmness level. Summary: Featuring the same high-quality construction iMovR EcoLast Continuum Mat is intended for work spaces outside corporate offices. 15 non-standard sizing options with 20-degree beveled edges ensure safety whenever you decide to use it – be it the warehouse, fire station, or pharmacy. While the 3/4 inch thick polyurethane surface provides enough comfort to have earned the mat a seal of approval from American Podiatric Medical Association, the non-slip backing lent it a High Traction Certification from the National Floor Safety Institute. Already slated for addition to the Standing Desk Mat category are the anti-fatigue mats below. If you are considering a standing mat you don’t see listed above or below, please drop us a comment here and we’ll see about adding it in a future round-up. Please note that we do not generally review kitchen standing mats at this time, as we prefer to focus on our core audience’s interest in office standing mats for use with standing desks and treadmill desks. 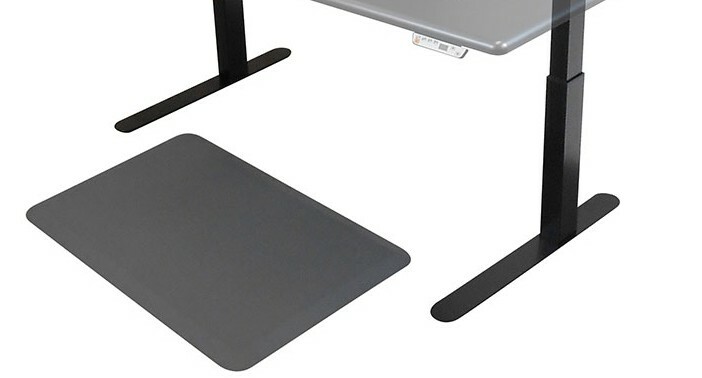 Also, check out one increasingly popular alternative to standing mats in our Standing Desk Balance Board Reviews round-up.